Rhodies in the Wild by Yolanda Frederikse, this print FRAMED is only $185! We originally posted this guide to gifting art right after Halloween, which, let’s face it, seems to be the true start of Holiday marketing campaigns. Since there are officially only 2 weeks left to Christmas, it seems like an appropriate time to revisit the subject of gifting artwork. 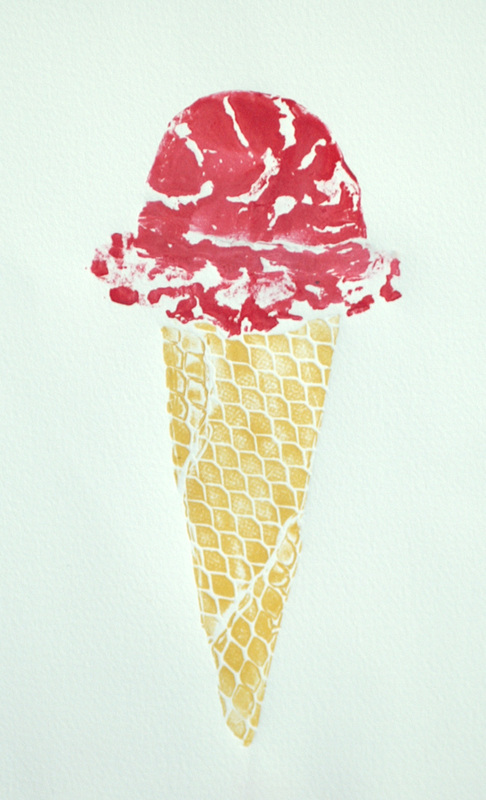 Sugar Cone by Anne McLaughlin -- only $70 for an original work of art! Perfect for a beach house, kitchen, or kids room. 2. Know their taste, and the Gallery’s return policy It is important that you know your gift-ee’s taste well enough to buy them a piece of artwork. Simply looking around their house can give you the confidence to buy the perfect piece of artwork. Note what colors they tend to like–is their kitchen painted yellow? Get a complementary print with predominant blues or purples or keep it in a similar color scheme with oranges and yellows. What sort of art and decor do they already have? See a lot of bold designs and abstracts? Then it might be best to steer away from soft, figurative work. In case you miss the mark, make sure you completely understand the Gallery’s return policy if you or your gift-ee want to return or exchange the work. WPG, for example, has a 30 day return policy on all work in original condition. "Scroll" from Grace Notes Suite by Trudi Y. Ludwig, $115 for the matted print. It fits into a standard 9x12 frame, so for an extra $20 you can give a framed work of art! 3. Don’t forget about Gift Certificates! (And Print Calendars!) If you’re absolutely stumped as to what your friends and family would like, but still want to get them an artful gift, think Gift Certificates! WPG can provide you with a gift certificate in any amount you require. Remember that even $25 can go a long way towards prints $100 and under! Also, as mentioned earlier this week, we have the 2011 Washington Area Printmakers Calendars in, $190 for 12 original prints. With that sort of variety, your gift-ee is bound to find something they like. Halloween has passed, which means it’s officially the start of the Holiday retail season. The TV is already full of commercials of Christmas trees, snow, and of course, presents! If you haven’t started thinking about it already, soon the pressure will be on to get your holiday shopping started. If you are looking for a unique and thoughtful gift, think about artwork–many galleries, including WPG–have very reasonably priced work (think our $100 and under bin). Here is WPG’s guide to deciding when is the right time and how to buy artwork as a gift. 3. Don’t forget about Gift Certificates! If you’re absolutely stumped as to what your friends and family would like, but still want to get them an artful gift, think Gift Certificates! WPG can provide you with a gift certificate in any amount you require. Remember that even $25 can go a long way towards prints $100 and under! As Black Friday approaches and the shopping frenzy whips up, I invite you to stop by any gallery, hopefully WPG. Not only will it be a nice escape from the holiday crowds, it can also be an unexpected source for gifts your friends and family can treasure for years to come.